Nikki Z's Studio 13 Designs: Yummy.....Sushi! 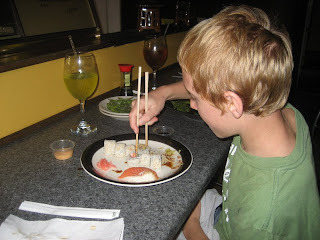 AJ loves sushi...I know that's kind of a weird thing for a kid to like, but he really does. We started off with some seaweed salad which he'd never had before, but he really liked. His favorite is nigiri, with salmon and then he had a california roll. 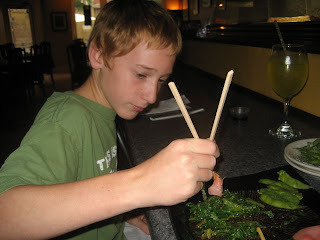 He's getting good with those chopsticks too!